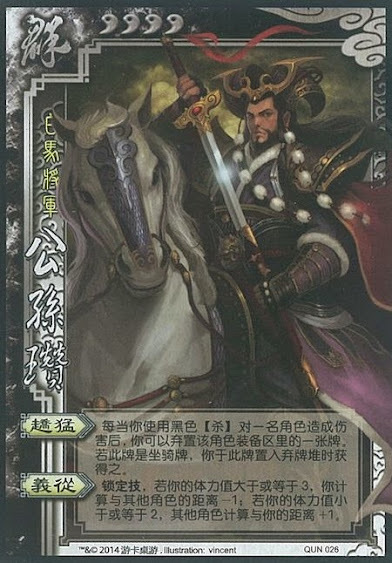 Whenever Gong Sun Zan causes damage with a black attack, he can discard an equipped card from the person that he damaged. If he discards a horse, he then puts it into his hand. When Gong Sun Zan has at least three health, he has a bonus -1. When he has two or fewer health, he has a bonus +1. If Gong Sun Zan damages more than one person with a black attack, with the Sky Scorcher for example, he can discard a cards from each of them. "Follower of Virtue" is the same power that the original Gong Sun Zan has.